NEW DELHI: A bill to make instant "Triple Talaq" - the Islamic practice of men divorcing their wives by stating "talaq" (divorce) thrice - a criminal offence was introduced in the Lok Sabha today. Law Minister Ravi Shankar Prasad called the "Muslim Women (Protection Of Rights On Marriage) Bill" an attempt to deliver justice and respect for women, and not about any religion or community. In August, a five-judge Constitution Bench of the Supreme Court had ruled that instant "Triple Talaq", which irrevocably ends marriage, was unconstitutional. The bill covers instant divorce or other similar form of divorce having the effect of "instantaneous and irrevocable divorce pronounced by a Muslim husband". Under the proposed law, "any pronouncement of Talaq" by a person - either spoken, written, in electronic form or in any other manner whatsoever - shall be void and illegal. It also seeks to punish a Muslim man, who attempts to divorce his wife using "Triple Talaq", by jail for a maximum of three years and a fine. But unlike most other criminal offences that come with a three year sentence, the bill makes the offence cognisable. This means that a Muslim woman will not need to approach a court but the police which can straightaway arrest the man without a warrant. Also, the offence has been made a non-bailable offence which implies only the court - and not the police - can release the man on bail. The bill also entitles women, upon whom Talaq is pronounced, the custody of her minor children. The woman can also seek a subsistence allowance from herself and her dependent children. A magistrate will decide on the amount of this allowance keeping in view the husband's income. Law Minister Ravi Shankar Prasad said the jail term had been incorporated in the provision because cases of instant divorce by Muslim men continued to be reported despite the top court's ban. 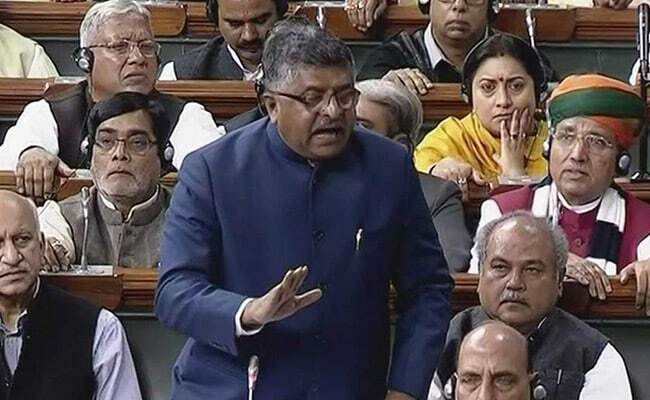 Ravi Shankar Prasad told the Lok Sabha that the government had been able to track 300 cases of instant "Triple Talaq" in India this year. Nearly 100 of these cases were reported well after the Supreme Court ruling including one case reported this morning: a Muslim woman was divorced in Uttar Pradesh for waking up late, Mr Prasad said. The Congress has backed the government on bill but suggested some changes to make the provisions to protect Muslim women. During the debate in the Lok Sabha, many opposition leaders have asked the government to revisit the provision for jail term for the Muslim man who attempts to divorce by instant "Triple Talaq". It was pointed that the man would not, if he is jailed, be able to provide a subsistence allowance. The government has allayed this fear, saying that courts were free to release the man on bail. Also, the magistrates have been given a free hand to send the man to jail for a shorter duration. The law does not specify a minimum jail term that those found guilty would have to serve.